Discovering the Supernatural | Karmal Books online Christian books and media store. Please take note that you can still place orders if our stock level shows (0) or if you wish to order more than what we currently have in stock. We place items on back-order and will source items that are out of stock if you are willing to wait. Prices on out of stock items depend on the current Dollar price and could be different at the time of ordering. We will confirm the price with you. Disclaimer: Availability may not be 100% accurate. Are you ready to go deeper with God and experience the supernatural in your life? God loves communicating and interacting with us in our everyday life, He wants to draw us closer to Him and take us to a higher level of spiritual functioning. Unfortunately, most people do not know how to activate this deeper supernatural understanding and grow deeper in their relationship with God. Discovering the Supernatural draws from Doug Addison's personal journey and shares stories of his heavenly encounters with God and the angelic realm. 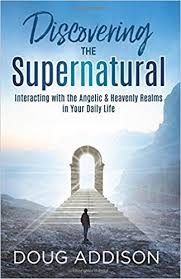 In this book, you will get an insider account as Doug addresses the questions he had along the way and answers questions others have asked him as they have learned to hear God and understand the supernatural. "I consider this book to be ministry-school-level-training for you. I normally do not teach this material outside of ministry schools because it does require a certain level of maturity, but I felt God tell me to go ahead and write this book for people who are ready to go deeper with God and experience the supernatural in their daily lives." © 2012 www.karmalbooks.co.za - All Rights reserved.